Birmingham author T. K. Thorne, a retired police captain, is writing hard. Her Last Chance for Justice, an extended commentary on the trials that finally brought the 16th St. Baptist Church bombers Bobby Frank Cherry and Thomas Blanton to account in 2001 and 2002, was informed by her intimate knowledge of Birmingham and twenty-two years in law enforcement. Noah’s Wife, a novel published in 2011, could not have been more different. Set in northern Turkey, near the Black Sea in 5500 BCE, this is the story of Na’amah, a young woman with unusual powers. Perhaps she is a kind of “Asperger savant,” or she may be secretly a priestess of the goddess at a time when her tribe is moving toward monotheism. In any case she marries an older man, Noah, definitely a man with a plan, who is not a seismologist, but just knows that there will be a geophysical catastrophe. And so it happens; the Mediterranean bursts through a natural wall of stone and raises the Black Sea a devastating amount. 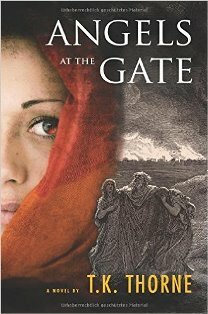 Now we have Angels at the Gate, much more modern, set in 1748-49, BCE, the Bronze Age, practically yesterday. Thorne has done, once again, a prodigious amount of research in Jewish and Islamic texts. The novel convincingly recreates the dwellings, utensils, food, business practices, and religious beliefs of the age. We learn about the smells from the neck glands of the male camels in rut. “Another source of the stench comes from the bulls beating their manhoods with their tails and then flicking the scent onto their backs,” she writes. The female camels, the cows, find all this irresistible. Although based on a few Bible verses people are familiar with, this tale is fully imagined and takes great liberties with the Bible story. Lot, for example, is not the virtuous fellow Genesis makes him out to be, not at all. Adira, Thorne’s heroine and narrator, is the daughter of Zakiti, of the tribe of Abram, a caravan master and business nomad, moving constantly, trading between Egypt in the southwest to Babylon, present day Baghdad, in the east. Adira is disguised as a boy for several reasons, but mainly to keep her safe. She has a dog she loves, a Saluki hunter named Nami, and a “pet” donkey. Ishmael, son of Hagar, second wife to Abram (Sarai is number one), is her buddy. Her father, a cunning merchant, schools Adira: negotiate; listen closely to people; observe strengths and weaknesses; learn to tell what they really want. A gifted natural linguist, her nomadic life gives Adira the opportunity to become multilingual, a skill which will save her more than once, and even affords some lost-in-translation humor. Although there are feminist parallels to the present and this novel is in a sense a retelling of the story of Lot’s wife—which Adira, to her regret, becomes—and the destruction of Sodom and Gomorrah, the corrupt cities of the plain, Angels at the Gate’s greatest strength is as an adventure novel: comparisons could be made to Tolkien or C. S. Lewis. Adira and her family fight desert raiders, endure drought and earthquake. She becomes involved, in every way, with Raph and Mika who are, perhaps, the angels of El, the new God. There is a long and fascinating trip to Babylon, where Adira serves Tabni, High Priestess of Ishtar, and Samsu-iluna the king. The climax is, as you might expect, in Sodom, which is a thoroughly rotten city, geophysically and culturally. The Dead Sea, undrinkably salty, is spewing up pitch, sulfuric fumes and even flames. More importantly, Sodomite culture is bizarre, and not just in the ways you may have heard about. They have massive city-fest style orgies, true, but worse, it’s a paranoid society, xenophobic and selfish: they even forbid beggars and giving alms is a crime. As Thorne describes it, destruction is well-deserved. Chapters of Angels at the Gate begin with epigraphs, usually from Genesis. It is a religious novel, set in a period of violent flux, with cultures leaving polytheism and goddess worship for the constraints of monotheism. Although it’s set in Southern Canaan, depicts obsession with forms of religious worship, and contains the occasional genetic surprise—who is secretly related to whom—this is not actually a Southern novel and, as a break from my usual reading, I found that very attractive, a refreshing change.